I read this article and found it very interesting, thought it might be something for you. The article is called Groundwater Levels Plunge, Contamination Rises, Crisis Grows and is located at https://archive.indiaspend.com/cover-story/groundwater-levels-plunge-contamination-rises-crisis-grows-37036. 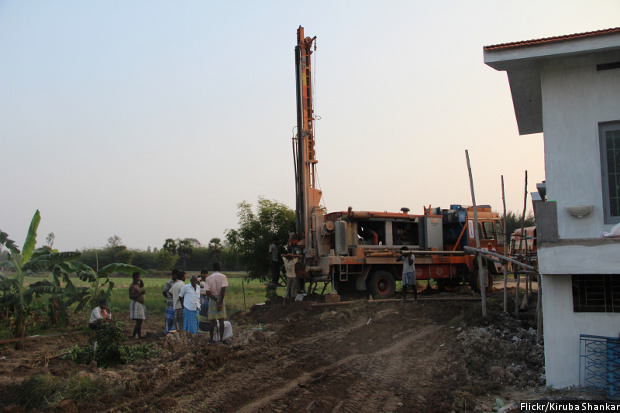 Borewell rigs are often seen in India’s hinterlands, as groundwater levels plunge, with little or no chance of recharge. Kolhapur (Maharashtra), Delhi: Five years ago, when Ramakant Desai, 55, hired a drilling rig to sink a borewell to irrigate his maize fields, he struck water at 200 ft. Today, the rig he hires must drill more than four times as deep to 900 ft. This is a common story in Desai’s village of Gargoti in the southern Maharashtra district of Kolhapur, as it is 682 km to the north in Jalgaon district’s Bhusaval, where Rajendra Nad, 52, narrates a similar story, complicated by fertiliser overuse. “Overuse of fertilisers has contaminated our groundwater,” said Nad, who farms millet, sorghum and groundnut. In a country where 74% of farmland is not irrigated–Government of India’s Department of Agriculture pegs it at 54%–and water shortages are growing–this report by EA Water, a water consultancy, warns India will become “water scarce” by 2025–depleting groundwater levels add to an ongoing farm crisis. In recognition of groundwater declines, Finance Minister Arun Jaitley said his government would spend Rs 6,000 crore on “groundwater management”, but the details are unclear. India draws more freshwater annually compared to any other country–761 billion cubic meters per year for domestic, agricultural and industrial use, according to four-year (2011 to 2015) World Bank data. The scarcity has worsened because more than half of that water is now contaminated, mainly by industry and sewage, sparking diarrhoea, typhoid and viral hepatitis. A common argument is that India’s growing water use in inevitable. But China, with 1.4 billion people, uses 554.1 billion cubic meters of freshwater every year–that’s 28% less than India. The consequence: India’s annual per capita availability of water fell 74% over 69 years, from 6,042 cubic metres in 1947 to 1,545 cubic metres in 2011, according to this water policy report of the Delhi government. Water depletion in rural India is a result of unsustainable agriculture practices, such as farms in water-scarce regions with water-hungry crops–paddy, cotton and sugarcane. In nine states–in south, west and central India–groundwater levels are now described as “critical”, according to this 2016 Parliament committee report on water resources. “Critical” implies a stage where 90% of groundwater has been extracted, with significant decline in recharge capability. As of December 2015, of 6,607 units (blocks, mandals, talukas) assessed, 1,071 in 16 states and two in Union Territories were categorised as “over-exploited”, which means 100% of groundwater has been drawn, with little chance of recharge. Groundwater levels in India are now more critical than anywhere else on earth, IndiaSpend previously reported. More than half of India now faces what is called “high” to “extremely high” water stress, most across the fertile Ganga-Brahmaputra basin, as this graphic indicates. More than half of India’s groundwater is contaminated, according to a Central Groundwater Board report. As many as 276 districts have high levels of fluoride, 387 districts report nitrates above safe levels, and 86 districts have high levels of arsenic, said the report. On average, contaminated water caused 10 million cases of diarrhoea, 740,000 cases of typhoid and 150,000 viral-hepatitis cases between 2007 and 2011, the groundwater board said.